We will be open for wine tasting and wine club sign ups from noon to 5 pm on August 29 and 30. Make plans now to visit the winery, located at 23076 Summit Road in Los Gatos, to taste a selection of our award-winning wines. 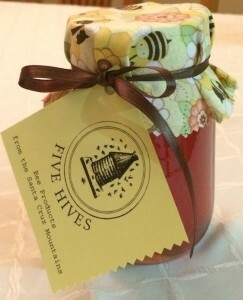 On both days, we will also be selling local Santa Cruz Mountains Wildflower Honey from Five Hives Bee Products. The hives are owned, managed, and tended by Villa del Monte winemaker Neil and his family. Honey will be available in three sizes: 4-ounce jar for $5, 8-ounce jar for $10, 16-ounce jar for $18. And if wine tasting and honey are not enough, we will also be harvesting and crushing Pinot Noir from two local Santa Cruz Mountains vineyards on Saturday morning. Should be a fun weekend — hope you can come by for a visit!